SCOTTeVEST isn’t your bog-standard GAP hoodie. The truly insane piece of apparel is intended for geeks on the move, and contains 19 different pockets designed to store sunglasses, cameras, iPads, several phones, passports, and more. It also comes with something it calls a Personal Area Network (PAN), which allows you to route cables between the pockets. So, if you’ve got a powerbrick (not included, sadly) and you want to charge your iPhone, you can gracefully snake a cable between both devices without it hanging out and catching on something. The hood also includes a flip-down “Do Not Disturb” eye mask. I imagine will be great for those long-distance flights where you’re sat next to someone who just won’t stop trying to talk to you about their grandkids. The SCOTTeVEST will be a hard sell for many people. I’m not just talking about the price; at $95, it’s far more expensive than the H&M or Primark equivalent. 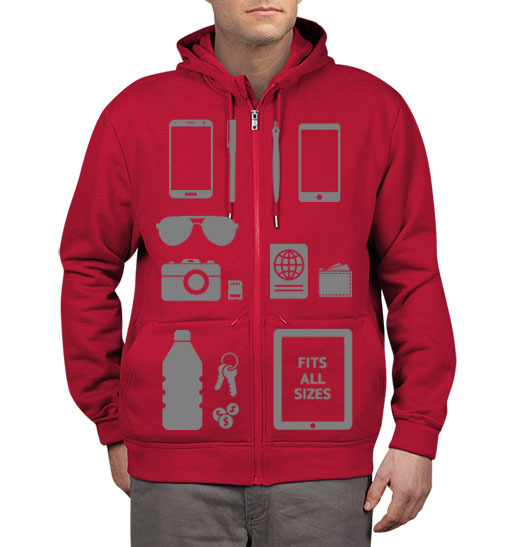 The idea of having a hoodie with so many components and an integrated charging system is rather outlandish. But for what it’s worth, I can understand the vision behind it. Hell, I can totally imagine wearing it. I travel a lot. No matter whether I’m walking down Las Ramblas, or meandering down the Via Dolorosa, pickpockets are a serious concern. The SCOTTeVest’s network of internal pockets makes it a lot harder for a would-be thief than leaving your iPhone in your jeans pocket, or your iPad in your rucksack. And then there’s the fact that taking off a single piece of clothing at airport security is a lot more graceful than emptying all of your pockets. The other passengers in line will thank you. The SCOTTeVEST is available from today via the SCOTTeVEST website, and on Amazon. It’ll be available in four colors – ash, black, cobalt, and maroon.